Dear Friend This www.guidenepal.weebly.com site have a main Propose to give a full information about the Nepal trekking and Travel. I think to Put the content as a normal and standard way which is easily find it . If you have some special program just inform me I will manage from my side very easily what you want. This site is Manage by trekking guide who play with Nepal Himalaya since 1997 work as a trekking Guide. In different country's Guest in different Places in Nepal Himalaya as a trekking guide . Who earn lot and lot experiences in Nepal Himalaya and all over the Nepal so Bhakti is a highily Recommended trekking Guide in Nepal . Please click those link you can find lot good comment in his life . Namaste and Greeting from Himalaya country Nepal , I am glad to know you click my site www.guidenepal.weebly.com . This site is my personal site which site will lead you all information about Nepal : Like Trekking in Nepal, Rafting in Nepal , Jungle safari in Nepal , Paragliding in Nepal and many more combine package trip in Nepal . I am a trekking guide in Nepal Since 1997 to till now , I really love my Job so I am always happy to do trekking and do outdoor activities in around Nepal Himalaya. In this site guide Nepal I try to give you more information about Nepal tour and Trekking . Namaste from Pokhara, Nepal! 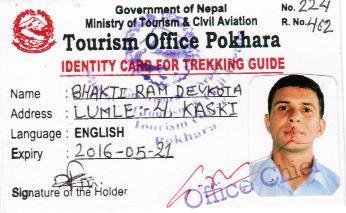 I've been a licensed trekking guide since 1997. 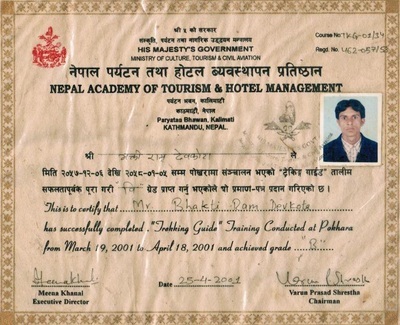 I\'ve done guide training provided by Nepal Government Ministry of Tourism, Hotel management & Tourism training center. The training course includes full knowledge about the himalayas, first aid, AMS, and many more. My trekking experience includes trekking in Annapurna, Everest, Langtang, Upper Mustang, Manasalu, Makalu, Mardi Himal, and most of Nepali mountains. I've been with tourists from the United Kingdom, the U.S, Australia, Japan, Korea, Russia, Germany, Austria, France, Spain, Italy, China, Hong Kong, Singapore, Taiwan, Canada, and many other nations. I really enjoy trekking, especially I get a sense of achievement when I look at the traveler/s that I am guiding and I can just see that I've done my job, very well too. When the traveler/s is in a bad condition, such as feeling altitude sickness, i know right away and i know what to do. I also know what to do at unpredictable situations and weather. I can plan itinerary for you if you don\'t have one already. I can meet you anywhere in Nepal, such as Kathmandu, Pokhara, etc. Namaste and greetings from the Himalaya country of Nepal. My name is Bhakti Ram Devkota. I was born to Rishi and Mandhari in the small but beautiful village of Lumle on 1 Aug 1978. I was five years old when I first went to school, in the neighbouring village of Chandrakot, from where there is a great view of the Annapurna Himalaya range. In those days Lumle was one of the main entry points for treks into the Annapurna Region, and I remember being fascinated by Western Tourists. I decided then that I wanted to become a guide when I grew up, so i could show my beautiful country to those people. After I graduated from high school I went to study Economics, Social Studies and Tourism in Pokhara. It was there that I got a chance to work as a trekking porter, and later as an assistant guide, in my free time. After I finished my degree, I had all the required tools to become a Trekking Guide. After more than 15 years, I have come to see myself as an ambassador for Nepal, as I am often the main link between my clients and my country.